Picking up steam, PAWSA received the firm backing of industry stalwarts Green Velvet and Nicole Moudaber who both locked down EP's from the innovative producer on Relief Records and Mood Records respectively. Further to that, he can also call upon the likes of Adam Beyer and Pan-Pot as staunch supporters. These early successes further cementing the feeling that PAWSA is a producer destined to make a lasting impact. 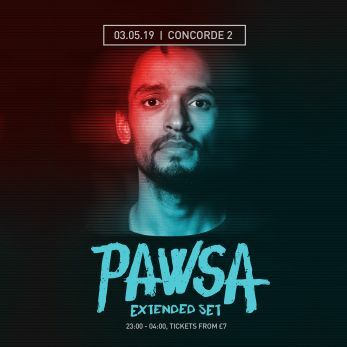 With that in mind, it's a joy to announce that we're bringing the man himself to Concorde 2 in May.